Collaborations and cross-licensing are the key strategies adopted by a majority of players in the global antibody library technologies market. In a new publication titled “Antibody Library Technologies Market: Global Industry Analysis and Forecast, 2016–2024,” the analysts at Persistence Market Research have observed that antibodies being a most successful biotechnology drug class, pharmaceutical companies are striving to add antibodies to their pipeline in order to alleviate patent cliff. While studying the various market segments the expert team of analysts have noted that North America represents the most lucrative regional market, followed by Europe and APAC. Another key observation is that despite phage display being the fastest growing technology, yeast display system is becoming a choice of technology due to the improved quality of MAB obtained through it. This report provides useful information regarding transitions in the business value proposition of key players. For instance, MorphoSys AG has set a goal to build the most valuable biopharmaceutical pipeline in the biotech industry and in line with this, the company is shifting its focus from technology licensing to drug development. Phage display is now one of the key drug discovery technologies and unlike in vivo technologies, phage display is not limited by immunological tolerance and toxicity to an animal. Thus, the popularity of phage display as a drug discovery tool is further increasing. The Phage Display segment is the largest segment among the four technology segments in the global antibody library technologies market and accounted for a little over 55% market share in 2016. This segment is anticipated to reach a market valuation of about US$ 100 Mn by the end of 2024, registering a CAGR of 5.0% during the forecast period. The Yeast Display technology segment is expected to create incremental dollar opportunity of US$ 9.3 Mn between 2016 and 2024. Mammalian Cell Display being a relatively new technology is the least attractive segment by technology in the global antibody library technologies market and represents a market attractiveness index of 0.3. Despite the fact that the phage display system is broadly utilized for protein and neutralizer designing, the technology is exceptionally prejudiced. Moreover, phage display system is exorbitantly repetitive and is more difficult as far as candidate’s identification is concerned. Another essential admonition of all molecular display systems is the background binding between the display system and the target antibody or protein. Unfavorable restricting may bring loss of high-affinity ligands as it might degenerate proper selection because of a large number of false positives. This factor is restraining the growth of the phage display segment of the global antibody library technologies market. Despite the fact that phage display and other molecular display systems are operative devices for antibody based drug discovery, numerous small-scale biotechnology organizations still utilize well-established hybridoma technology for the revelation of neutralizer medication competitors. Other conventional technologies are being favored over the molecular display method, such as transgenic creatures harboring, tissue culture techniques and so on. Eccentric hybridoma technology for the monoclonal antibody is an impediment to the growth of the technology segment in the global antibody library technologies market. In vitro production methods comprise a still-evolving field in finding new therapeutics and the lack of inclination to adopt new techniques by some small-scale biotechnology companies limits the widespread use of in vitro techniques. Moreover, a majority of MAB produced using these methods is for research grade, and thus is not used in clinical studies. This has led to the lack of awareness of regulatory pathways for therapeutic use of MAB produced in vitro. This presents a significant challenge for small biotechnology companies that have a potential therapeutic MAB candidate, but are not in a position to commercialize it due to the lack of full knowledge of regulatory procedures. The Phage Display segment is estimated to account for more than 50% revenue share in the North America antibody library technologies market by 2024 end and is expected to gain close to 300 BPS in its market share by 2024 over 2016. 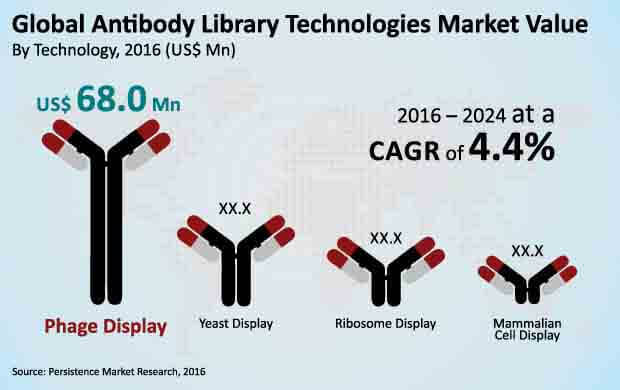 The Mammalian Cell Display segment is projected to expand at 3.2% CAGR over the forecast period and be valued at around US$ 9.4 Mn by 2024 end in the North America antibody library technologies market. The MEA antibody library technologies market is expected to gain traction due to the adoption of phage display systems in academic and research laboratories in Saudi Arabia.